Maine's distinction as the birthplace of Prohibition earns it a role in a Ken Burns documentary. In 1851, Maine became the first state to ban the manufacture and sale of alcoholic beverages, though an exception for “medicinal, mechanical and manufacturing purposes” kept many liquor wagons rolling. 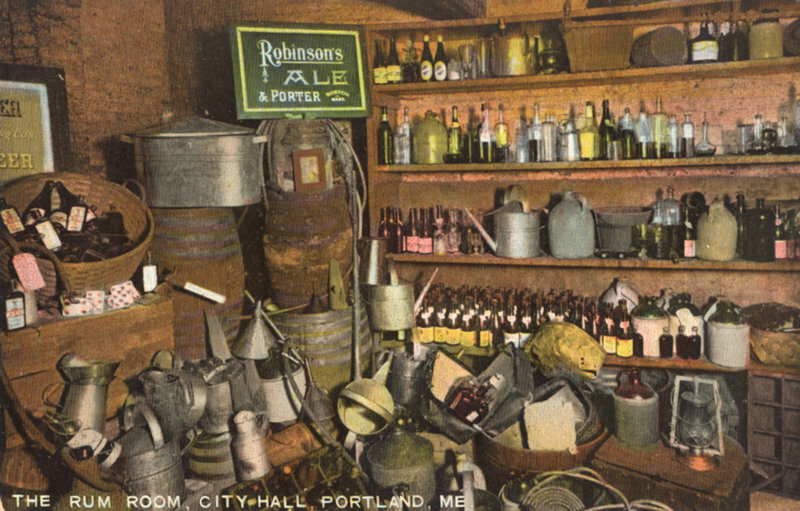 The Rum Room in Portland City Hall, where confiscated liquor and liquor-making equipment was stored, in an image from a postcard mailed in the early 1900s. Neal Dow, the so-called "Father of Prohibition"
Portland Mayor Neal Dow, the so-called “Father of Prohibition,” pushed the law through the Legislature, became a leader in the national temperance movement and ran for president on the Prohibition Party ticket in 1880. Many states and other countries followed Maine’s lead, culminating with the passage of the 18th Amendment in 1919 and the start of national Prohibition the following year. Lawmakers and temperance leaders might have taken a harder look at Maine’s experience and avoided the widespread pitfalls that prompted the national law’s repeal 13 years later. Many Mainers flouted the state’s dry law, concocting liquor at home and selling it to neighbors in “kitchen bars.” Farmers continued the age-old practice of turning apples and other fruits into hard cider and wine. Tavern owners saw fines as a cost of doing business. Pharmacies and groceries sold alcohol legally as medicines and flavor extracts. The Portland Rum Riot of 1855, when an angry mob gathered outside City Hall, left one man dead and seven injured. 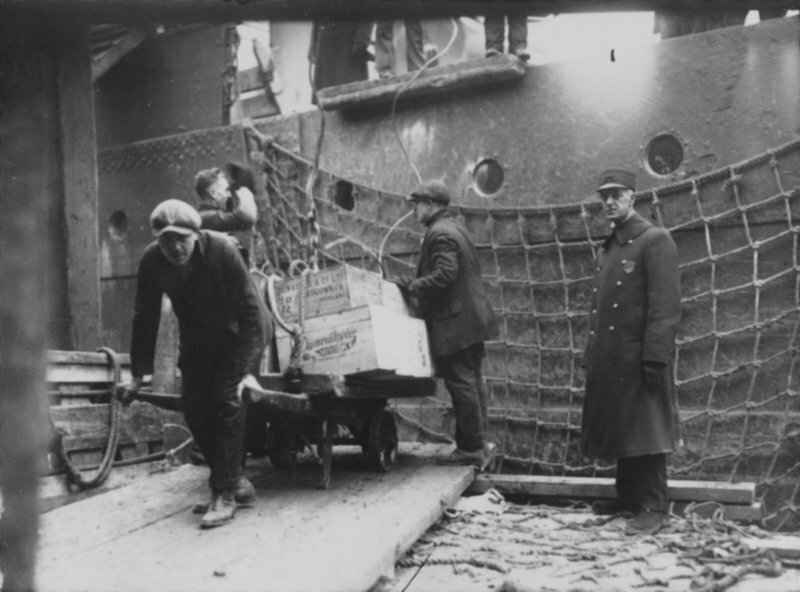 Maine’s bumpy history as the birthplace of Prohibition and a stronghold of the temperance movement will be featured in “Prohibition,” a three-part PBS documentary series that starts tonight. The series was directed by Ken Burns and Lynn Novick, award-winning makers of films about the Civil War, baseball, jazz and World War II. The documentary covers the development of drinking habits in America, from its founding when rum was the beverage of choice for many through the flood of European immigrants in the late 1800s. It explores the motivating factors that led to Prohibition and its links to women’s suffrage, changing social mores, anti-immigrant fervor, organized crime and advances in the legal system. They selected photographs of Mainers at work, on the streets and in churches. One shot captured the H.H. Hay Apothecary on Congress Street in Portland. They also chose the following headline from The State of Maine newspaper in Portland on June 5, 1855: “Atrocious Outrage! Citizens fired upon by order of Mayor Dow. One Man Killed, Seven Wounded!” The shocking story ran on page 2. In Maine, as in most of the nation, the temperance movement was a complicated issue born from frustration with widespread drinking as a cultural norm and the socioeconomic problems it caused, including poverty and domestic violence. In the early 1800s, when the city had about 9,000 residents, there were more than 200 licensed liquor establishments in downtown Portland. The world’s first Total Abstinence Society was founded in Portland in 1815 and a statewide organization of local temperance groups formed in 1834. Temperance leaders focused on alcohol as the source of society’s ills. Many of them, like Dow, positioned themselves on a religious and moral high ground and expected others to climb the hill. Some were also abolitionists who wanted to end slavery. As more immigrants came, expanding the working class and diversifying public drinking habits, the temperance movement grew more political. By the time the Maine law passed in 1851, temperance groups had been fighting for liquor reform for 25 years. It was repealed in 1856, following the Portland Rum Riot, when opponents of the law stormed City Hall because they thought Dow was selling liquor stored in the basement. The law was re-enacted in various forms and eventually folded into the state constitution in 1885. “They kept tinkering with the law, but it never really worked,” said Bill Berry, a reference assistant at the Maine Historical Society who worked on the 1998 exhibit. The Maine law not only laid the foundation for national Prohibition, it also broke legal ground by establishing a standard for justifiable search and seizure, wrote Wesley Oliver, a law professor at Widener University, in the Maine Bar Journal. The law allowed a magistrate to issue a warrant to search for liquor in a building if at least three complainants had probable cause to believe alcohol was there. 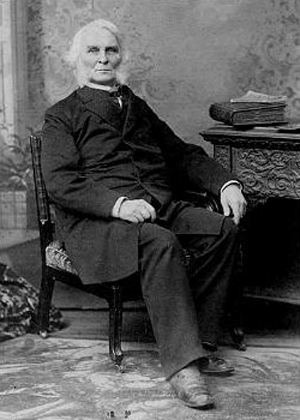 An additional provision, drafted by Portland lawyer Edward Fox, required at least one of the complainants to swear and provide evidence that he had actually witnessed the sale of liquor at the house. The law made it possible for police to investigate crimes on behalf of victims or witnesses in a way that would stand up in court. The Maine law remained in effect until the repeal of national Prohibition in 1933, amid the Great Depression. Through the years, it was celebrated, tolerated and reviled. During Portland’s three-day centennial celebration in 1886, several events featured temperance songs and Dow delivered a long, glowing account of society’s improvement under the Maine law. As pressure for national Prohibition grew, President Theodore Roosevelt pointed to Maine’s experience as reason to think twice, according to the “Text-Book of True Temperance,” published by the United States Brewers’ Association in 1911. The nation went ahead with the “noble experiment” of Prohibition despite Maine’s example, and the temperance movement continued in Maine for decades after the federal law was repealed. Ben Bubar of China, then superintendent of the Christian Civic League of Maine, ran for president on the Prohibition Party ticket in 1975. The Maine Women’s Christian Temperance Union, located in the Neal Dow House at 714 Congress St. in Portland, is the last group of its kind in the state and has about 20 members. The PBS series comes during a period of rejuvenated interest in the Prohibition era, including HBO’s award-winning dramatic series, “Boardwalk Empire.” The interest doesn’t surprise Shettleworth, the state historian. It was a pivotal time in America and encompassed issues far beyond alcohol. But the intrigue of the forbidden is paramount.